ST. PETERSBURG – These cute Russian dogs are making me a little homesick for my baby back in Cow Town. 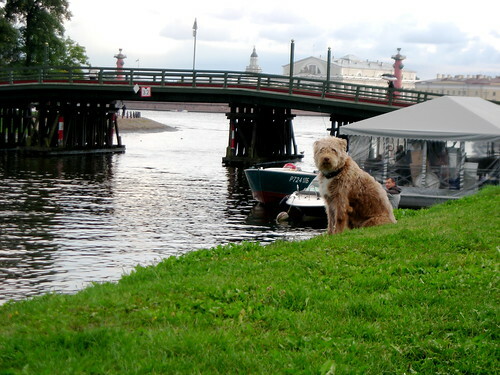 On my first night in St. Petersburg, we met this shaggy pooch along the banks of Zayachy Island. He was hanging out with fishermen hunting for dinner near the Neva River. 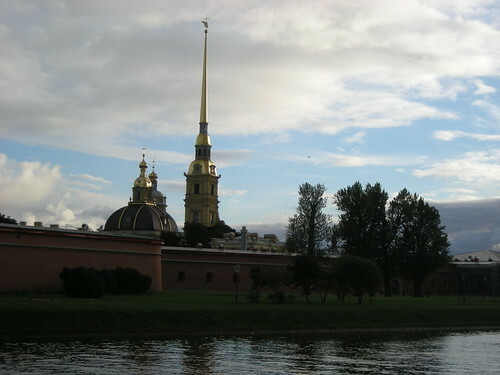 Pavel, one of my university host, said I should probably avoid any of the fish caught from the Neva River. He mentioned something about river pollution. Good to know. 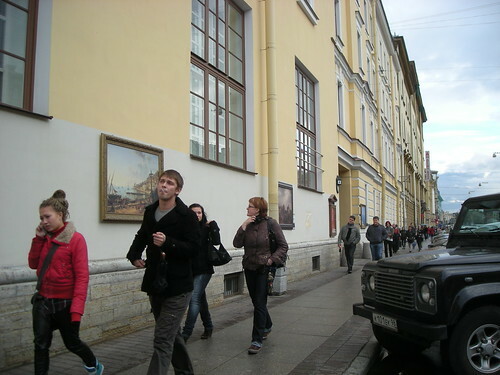 I got my first taste of Russian art on the way to the Church of our Savior on Spilled Blood. Reproduction of Russian masterpieces hung outside on this building. I thought it was a delightful way to show off national art and encourage people to see more inside the museum. One painting of Russian prisoners being shipped off to Siberia reminded me of Dutch painters – dark shadows and vivid facial features. Another painting of a Russian countryside reminded me of dreamy Van Gough landscapes. St. Petersburg is a beautiful city. I can’t wait to see more of it! Facebook friends and RSS reading peeps – please check out my blog link to see a lovey Flickr photo slideshow on my first night in St. Petersburg. Hope you are having a fabulous time! Can’t wait to hear all the great stories!